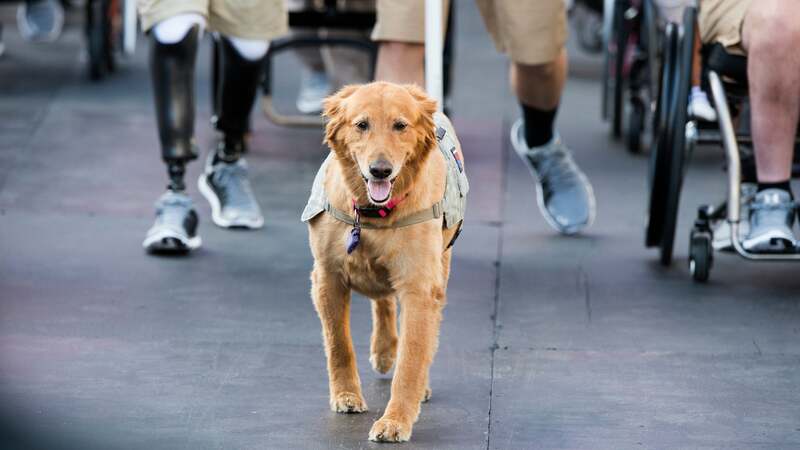 Service dogs have an important job to do, but that doesn't make them any less cute. If you want to say hello to or pat a service dog, follow these guidelines to greet them the right way. Never attempt to control the dog either with commands or by taking physical control of the leash or collar unless asked to do so by the owner. Service Dogs may do things that seem unusual. The dog's owner has been trained how to handle their dog and how to be safe and effective in public. Approach the owner and ask if you can pat the dog. Be specific about what you want to do so the owner knows what you're really asking. General phrases like "Can I say hi?" make it harder for the owner to anticipate your actions and give you the right instructions. "Excuse me, I know your dog may be in the middle of a task. Would it be ok for me to pat them?" "Hi! I understand if your dog can't take a break. Would it be ok for me to pat them?" "Hey there! Your dog looks like they're working, can they take a break for me to pat them?" If the owner declines, thank them and let them go about their day. If they say yes, ask if there is a particular spot you should pat. You can follow these same guidelines if you're interested in your child or own dog interacting with the service dog. Just adjust the above phrasing to match your situation and keep the child or dog away until the owner gives permission to approach. Follow any instructions the owner gives you. They may ask you to pat the dog in a certain spot (probably the dog's favourite spot!) or stop patting if the dog moves from their commanded position (like sitting or lying down). You should also be ok with walking away after a short greeting in order to not overstimulate the dog. Listen to what the owner tells you and don't take it personally if they ask you to stop patting their dog or move away. They know what works best for their dog and what complies with the dog's training. One of the main issues with letting people pat or greet service dogs is that it can distract the dog from their work. Pat the dog gently and speak to them in a calm, happy tone to help keep them in a calm state so they can easily transition back to working. If you're the type who likes to rough house or get dogs excited when you greet them, resist your instincts and stay calm. If you have food, or even dog treats, don't feed them to the dog without the owner's permission. If you really want to give the dog a treat, ask the owner first and see if they prefer you to use a treat they have rather than your own. The service dog's owner is trying to go about their day, just like you, so try not to take up too much of their time. I know, we could spend all day patting cute doggos, but keep your greeting session to a couple of minutes and then move on. Don't question the owner's need for a service dog or their disability. Service dogs assist all types of people and it is not up to you to decide whether someone needs a dog or is disabled (many disabilities are invisible). Most owners will be open to you asking about their dog (normal questions like their name or if they know any tricks), but refrain from invading the owner's privacy by asking why they need the dog or what their disability is. As an Assistance Dog owner, thank you for this! But also, dont distract the dog in anyway (even in training). Dont yell out to the dog, try to call the dog over, dont throw things at the dog, dont feed the dog. Theres a whole bunch of other stuff but its a great start! All seeing eye dogs are assistance dogs, but not all assistance dogs are seeing eye dogs.